Apartment with much love furnished in the new and modern complex Casilla de Costa. In addition to two large double beds waiting for you a fully equipped kitchen with quality appliances. The upscale equipment is also high demands. The roof terrace offers a beautiful view over the entire north of the island. The beautiful and large communal pool invites you every day to relax. The unit has its own storage room on the ground floor. Ideal for sports equipment of all kinds. The development of the large and extensive complex Casilla de Costa is not yet completed. This may occasionally cause slight acoustic disturbances. We love Fuerteventura and equipped with this love the apartment. We want to give you a wonderful and unforgettable time on the island. Arrive and feel at home, that's our motto. We are convinced that the object will meet the high demands. The unit was completed in late 2017 and set up in 2018. The exclusive use of the spacious pool is not uncommon. If you are looking for relaxation, you are right here. 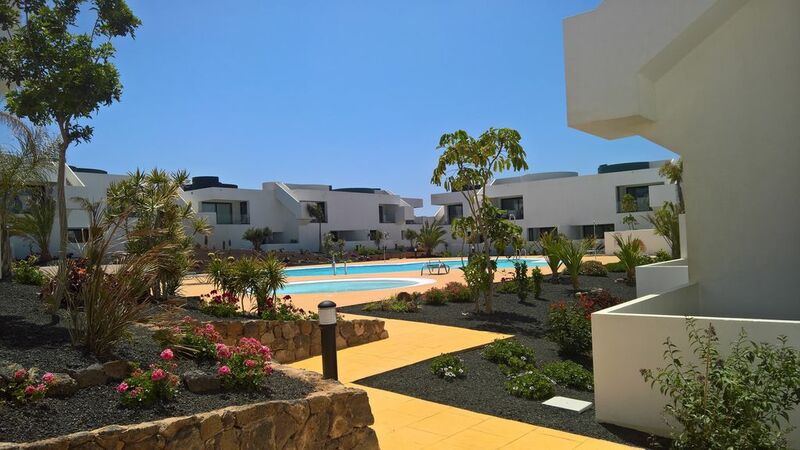 The new complex Casilla de Costa is located on the edge of Villaverde, the Beverly Hills of Fuerteventura, between the extinct volcanoes Escanfraga on the east side and Arena on the west side. The village of Lajares is close by and is not only an insider tip among surfers. The view from the terrace to the mountains, embedded in the sea from three directions, inspires every day to explore this beautiful island. In the area and Corralejo you will find everything your heart desires, within a few minutes by car. Hiking, supermarket, beach, restaurants, nature, rough coasts and shopping. Water sports enthusiasts will get their money's worth here (kiting, surfing, SUP courses). To the apartment is also a sufficiently large storage room, which can be used for all sorts of sports equipment of you. They do not have to bring a lot. You can use the beach sports & leisure equipment in the apartment. And if you like it romantically, you will also find a nice picnic basket in the apartment. !!! A tip, not only for fresh lovers !!! One of the most beautiful sunsets over the sea you can enjoy in El Cotillo at the lookout "Torre del Tostón". A really absolute highlight. You will find a few restaurants nearby for this atmosphere. Supermarket and village ( la Oliva or Lajares ) are 5 minutes driving. We loved the small market in la Oliva- el Coronel on tuesday and friday with fresh vegetables and typical local cheese. The interior is cozy and charming and we felt like at home . Thanks to Stephan and hope to come back very soon! Thank you so much, we are looking forward to seeing you again soon. Wir waren das erste Mal in dieser Ferienwohnung und sind sehr zufrieden. Jederzeit wieder. Die Wohnung ist sehr liebevoll und modern eingerichtet, es fehlte uns an nichts.Die Anlage wird täglich gehegt und gepflegt . Für eventuelle Probleme hat man einen Ansprechpartner der jederzeit erreichbar ist und sich um alles kümmert. Wir fühlten uns rundum wohl und betreut. Our 2nd stay here and it was just as relaxing as the 1st time. We hope to be back in September. Abbiamo soggiornato nel periodo genn/marzo 2019 in casa Skadi. Casa accogliente ed arredata con gusto, funzionale la disposizione degli ambienti e completa di tutto, non manca nulla per un piacevole soggiorno. La Sig.ra Bonny collabora ottimamente per una perfetta pulizia della casa, con relativo cambio settimanale della biancheria letto, bagno e spiaggia, completando così la cortesia e gentilezza del lontano proprietario, Stephan. Purtroppo le condizioni climatiche non ci hanno permesso di godere pienamente degli spazi esterni, terrazza, ampio solarium superiore e piscina comunitaria, ma anche nelle giornate di pioggia, il restare all’ interno era divertente grazie ad una buona smart TV(anche se priva di canali italiani) e ad alcuni giochi collettivi. In conclusione 5 stelle per la casa…3 per il meteo ed un sentito grazie a Stephan ed a Bonny per averci fatto trascorrere delle buone vacanze. Sandro & Co.
Alles neu, super schöne Ausstattung. Wir hatten ein Auto,sind überall hin gefahren, die Strände sind mit dem Auto leicht erreichbar, Corralejo ist in der Nähe, dort finden Sie viele Restaurants ,Clubs und Einkaufsmöglichkeiten. Die Außenanlagen wird regelmäßig gepflegt, Sicherheitspersonal ist sehr hilfsbereit, Unterkunft top, Netter und zügiger Kontakt zum Vermieter. Da zentral im nördlichen Teil der Insel gelegen, ist es der ideale Ausgangspunkt für Ausflüge jeder Art, zB. nach Lanzarote oder Abends kurz in die Hauptstadt. Natürlich ist es auch in der Anlage, auf der großzügigen Dachterrasse bei schönem, windstillen Wetter Wert einen Tag zu verbringen. Wir konnten jedoch auch zwei Tage einen "roten Sandsturm" miterleben. Wir hoffen, dass es dem Vermieter gelingt die FeWo. auch in weiterer Zeit in diesem einwandfreiem Zustand zu erhalten. Sauberes Domizil, sehr schön eingerichtet. Alles da, was zum Aufenthalt benötigt wird, tadelloser Zustand.